Best visible at 21:00 (9 p.m.) during the month of February. Gemini is one of the constellations of the zodiac. It was one of the 48 constellations described by the 2nd century AD astronomer Ptolemy. It is one of the 88 modern constellations today. Its name is Latin for "twins." It is from the twins Castor and Pollux in Greek mythology. Its symbol is (Unicode ♊). 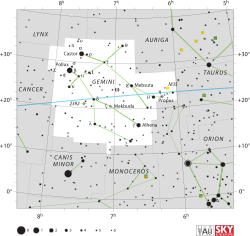 The constellation Gemini as it can be seen with the naked eye, with added connecting lines. An animation of the constellation Gemini (center), "the twins", shows two parallel stick figures. Gemini is associated with the myth of Castor and Polydeuces (also known as Pollux). They are all known as the Dioscuri. Gemini lies between Taurus to the west and Cancer to the east. Auriga and Lynx are to the north. Monoceros and Canis Minor are to the south. The Geminids are a meteor shower that can be seen best on December 13–14. People watching it see about 100 meteors per hour at most. It one of the richest meteor showers. The Epsilon Geminids peak between October 18 and October 29. They have only been recently confirmed. They overlap with the Orionids. This makes the Epsilon Geminids hard to see. Epsilon Geminid meteors move faster than Orionids. Gemini as depicted in Urania's Mirror, a set of constellation cards published in London c.1825. In Babylonian astronomy, the stars Castor and Pollux were known as the Great Twins (MUL.MASH.TAB.BA.GAL.GAL). The Twins were thought of as minor gods. They were called Meshlamtaea and Lugalirra. These names meant 'The One who has arisen from the Underworld' and the 'Mighty King'. Both names can be understood as titles of Nergal, the major Babylonian god of plague and pestilence. He was king of the Underworld. Diagram of H.A. Rey's alternative way to connect the stars of the constellation Gemini. Twins are shown holding hands. Castor and Pollux are the brightest stars in Gemini. They are two bright stars that appear very close together forming an o shape. 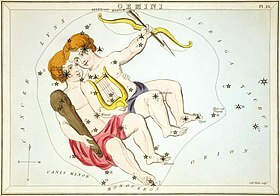 The Sun appears in the constellation Gemini from June 20 to July 20. In tropical astrology, the Sun is in the sign Gemini from May 21 to June 22, and in sidereal astrology, from June 16 to July 15. ↑ Ridpath & Tirion 2001, pp. 150-152.